Now all you Southern gals know that there is not a Southern home complete without some sort of home decor display featuring a monogram...it's just a rule. There is no use in arguing with it. If you have a monogrammed wooden letter sitting on your bookshelf or a monogram wreath hanging on your front door, or monogrammed towels, then you can rest easy tonight. But if you don't, you most definitely need to keep on reading, because I am going to show you one of the easiest ways to grace your home with the unparalleled presence of the infamous monogram. This DIY tutorial is for one of my favorite monogram projects I've done yet - the Monogram Letter Wreath. More and more people are using wreath alternatives to hang on their front doors, and the Monogram Letter Wreath is one of those alternatives. A Monogram Letter Wreath is not really a wreath... it's basically just 1 letter (your last initial) or 3 letters (full monogram) that are hung with ribbon on your door or inside your home. Monogram Letter Wreaths can come in many different forms. Some are made of metal, some wood, and some are made of other materials. 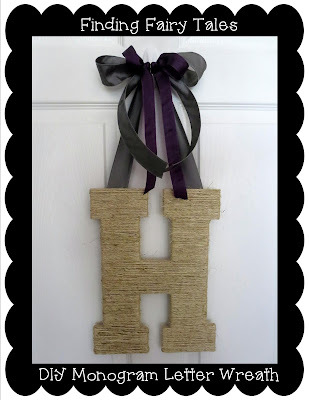 The one I am going to show you how to make is made using a wooden letter wrapped in twine. I really love this look because it is very classy, but has more of a shabby chic look to it....and the twine gives it a very natural feel. I made this particular monogram letter wreath for my good friend, Angela, as a one of my gifts for her monogram bridal shower. It made a great gift for a friend, but I love it so much that I can't wait to wait to make one for my own home too! First, take your twine, and hot glue the end piece of twine to the back side of the top of your letter. Make sure the hot glue isn't too thick because you're going to have to wrap over it. Start the twine at the very top and just keep wrapping the twine around the letter. Keep pulling the twine very, very tight as you wrap! As I'm sure you can gather, the method in which you wrap the twine is going to be different depending on the letter you are working with. This letter "H" worked particularly well, because it is one of the letters of the alphabet that is perfectly symmetrical. 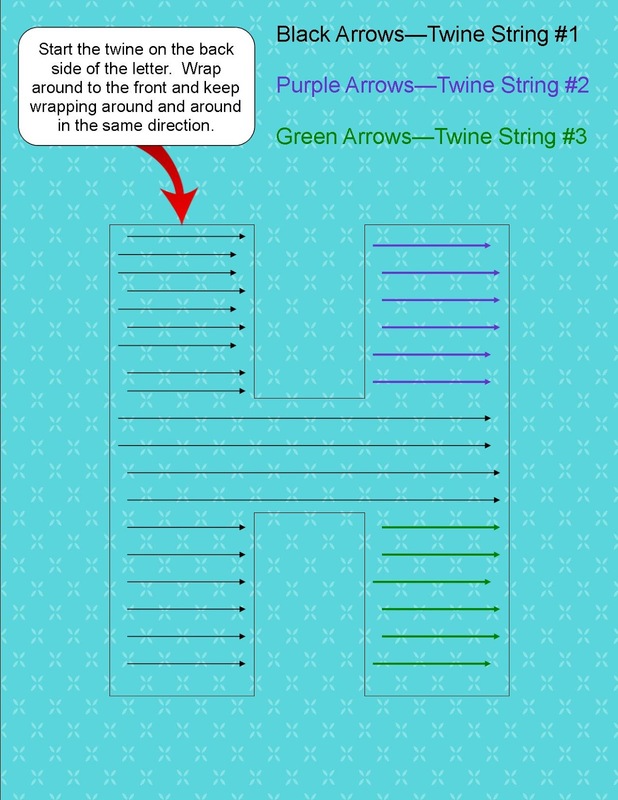 As you see in the diagram below, it took 3 separate pieces of twine to make the Letter H. I started on the back side of one of the left part of the letter, kept wrapping the twine until I got to the middle section, continued the twine all the way around the width of the letter, and then went back to the left hand side and finished at the bottom. Then I had to use two other separate pieces of twine to finish the right top side and the right bottom side of the letter H (indicated by the purple and green). You want to use as few separate pieces of twine as possible, so keep wrapping it as far as you can before you cut it and start a new piece. As you can see to the left, after you finish with a piece of twine, you can just loop it around another piece on the backside of the letter (so you don't see the knot) to secure it. This must be done very tightly. What you will notice is that on the top and bottom edges of the letter, it does not take too much pressure for the twine to slip off of the edges of the letter. To prevent this, I just put a tiny bit of hot glue under the beginning and ending pieces of twine (on the edges of the letter mostly) so it would have more than just the knot to keep the twine on the letter. 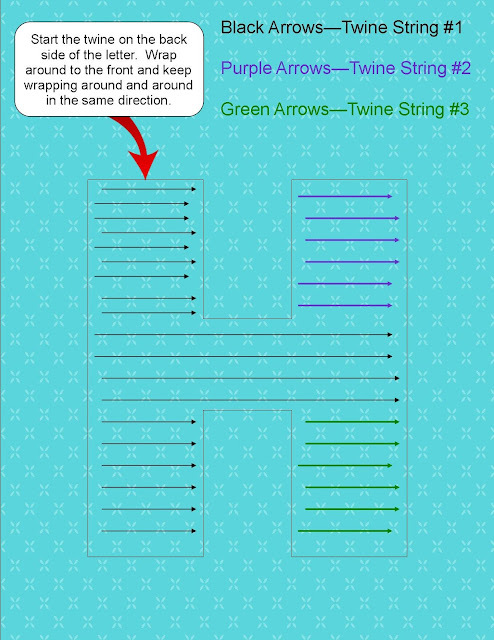 When you are done wrapping the twine around the entire letter and have secured the ends of twine, turn the letter over to the backside. Cut two longer pieces of your wired ribbon and hot glue the ends of the two pieces of ribbon to each of the top sides of the letter. Hold up both pieces of ribbon and tie your bow. Don't worry if you don't get it right the first time...ribbon is resilient! It took me like 4 times to tie a good one. I'm a perfectionist, what can I say?? My friend Angela's wedding colors are a deep purple and a charcoal grey, so that is why I decided to do two different ribbon colors. I'm glad I did, though, because I think it gave it more depth - and the purple pops against the grey! To get the two-tone bow effect I tied a bow using the purple ribbon and then attached the already made purple bow to the grey bow with another small piece of purple ribbon . I just put the bows on top of each other and wrapped the little piece of purple ribbon around the two bows and hot glued them at the back side as you see below. DISCLAIMER: Just in case you didn't know, HOT glue is very HOT, so don't let it drip on you... :( You'd think as a teacher I would have learned this lesson already....but apparently not. This little project was lots of fun, and the end result was especially worth the time and effort because it was for a dear friend. Happy DIYing! Hi! I'm Beth......wife to my firefighter husband, mommy to TWO beautiful boys (3 years & 11 months), 2nd grade teacher, and DIY enthusiast! I love the Lord, my family, and being crafty and creative. Thanks for taking the time to stop by and read about life, love, faith, motherhood, babies, breastfeeding, DIY, keeping an organized home, and anything else on my mind! God Bless! How Do You Know If You're a Teacher?